The very best party size Italian Melt. 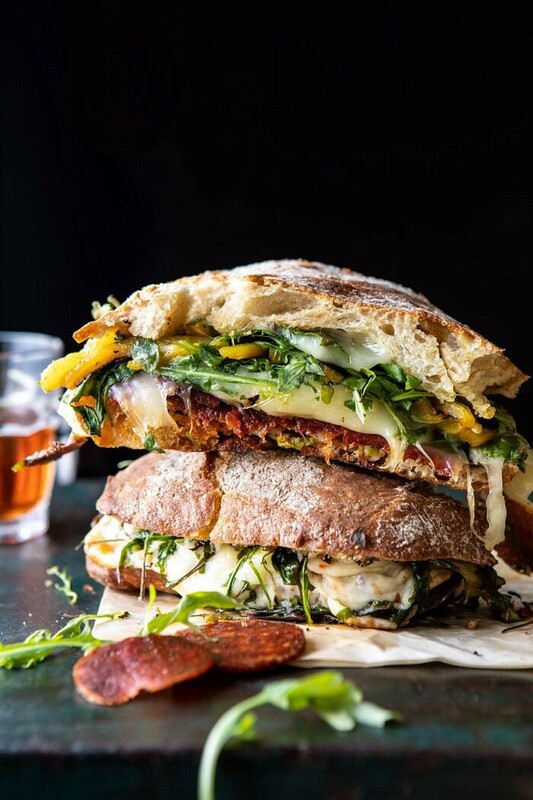 Crusty ciabatta bread, sandwiched with homemade Italian vinaigrette, spicy salami, salty prosciutto, fresh baby arugula, roasted peppers, provolone AND mozzarella. All baked until toasted and melty. Yes, this is every bit as DELICIOUS as it sounds. It’s also the easiest way to serve up a melty sandwich to a hungry group of guests. Perfect for your game day eats…and every other occasion in between. Meet the party size Italian melt 100% inspired by my eldest brother Creighton. 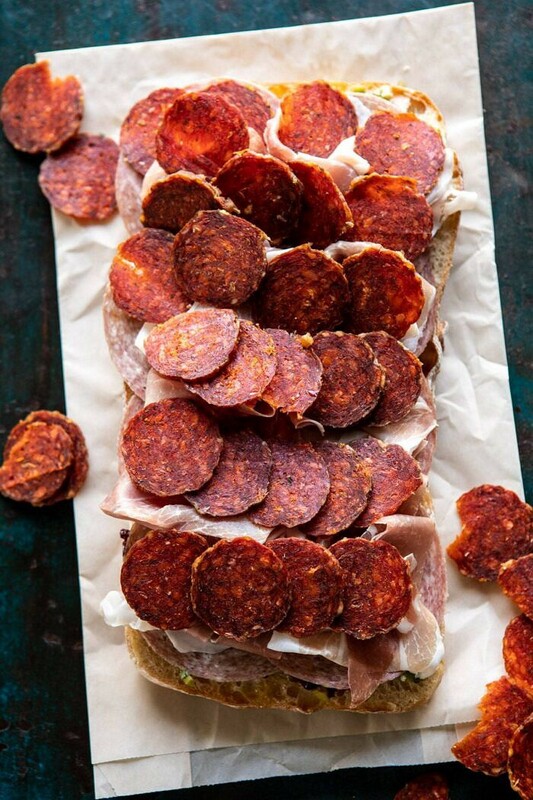 Creighton loves a cheesy melt…along with salami, prosciutto, and pepperoni too. He’s one of those real “guys, guys”. He hates quinoa, loves meat, and prefers his veggies to be in the form of tater tots. Yes, that was actually Creighton’s response when I once asked him what his favorite veggie was. I love him dearly though, so every time I see him I’ll sneak broccoli into his tater tots (broccoli tots!!). Anyway, if he were here, he would love this melt. It’s cheesy, filled with Italian meats, veggies, and the best homemade vinaigrette, so good! 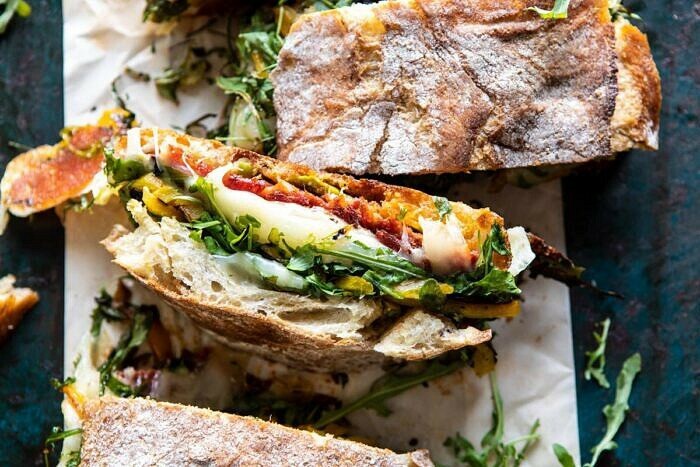 Everyone in your life is going to love you for this sandwich. 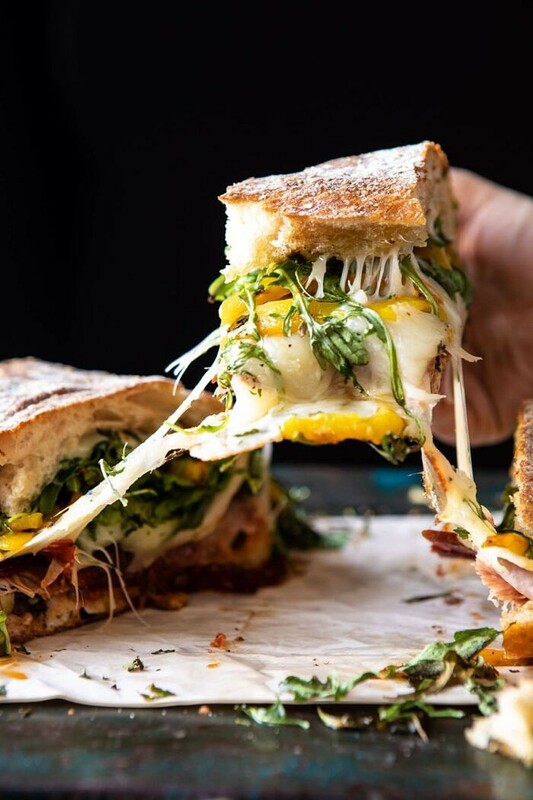 Basically, it has all the components of your very favorite cheese board…bread, olives, peppers, spreads, meats, and cheese…all piled high onto a warm and melty sandwich. It’s every bit as delicious as you can imagine. Maybe even better than a cheese board, because well, there’s melted cheese and warm toasted bread. I’ve been dreaming up this sandwich in my head for a while now…going back and forth on just how to make it. Honestly, for me, I can often do without meat on my sandwich. I’m much more about the cheesy, veggie, carby situation. BUT there’s a time and a place for a sandwich like this, and Super Bowl Sunday is certainly it. Start with a good, crusty loaf of ciabatta bread. It’s my very favorite, especially for making sandwiches since it can really hold up to sauces and oils without getting too soggy. Spread the bread with a little homemade red wine vinaigrette. Just a simple mix of olive oil, red wine vinegar, lemon, garlic, and lots of olives. Now the meats. 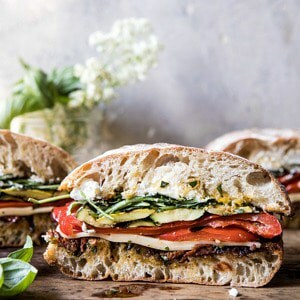 As I mentioned earlier, I debated about whether or not to go all out and do more of a true classic Italian style sandwich, or do something a little lighter and keep things vegetarian. In the end, I decided that I wanted this to be more of a hearty sandwich. One that’s best for wintry months, and for serving up on game day. So I added spicy salami, salty prosciutto, and thin slices of spicy pepperoni. It’s a lot, but so good, and they make for a really great combination. Of course, if there’s any meat you don’t like, you can certainly opt it out. I will say, the meats add a really delicious flavor and heat to the sandwich. Therefore, I do recommend giving them a try. Delicious. If you’re looking for something vegetarian, I suggest you make these spicy chickpea pepperoni and use in place of the meat. I’m sure these would be delicious as well! Next up the cheese. I used a combination of sharp provolone cheese and fresh mozzarella. Perfect Italian combo if you ask me. Finish things off with a handful of baby arugula and roasted bell peppers. These provide some much needed veggies, not to mention color. Next, bake the entire sandwich in the oven until the cheese has melted and the bread is toasty. YES, bake the entire sandwich all at once. No flipping multiple sandwiches, no standing at the stove, and very little mess. Could not love it more. You can cut this into 4-6 larger sandwiches and serve more as a meal. Or cut the loaf into about 8 smaller sandwiches and serve as appetizers. Either way, everyone is going to devour this party size melt. Best part? You can assemble the sandwich in advance, wrap it up, and keep in the fridge until ready to serve. Then, all you have to do is bake, cut, and enjoy! Great for entertaining or as an easy family dinner. If you make this party size Italian melt, be sure to leave a comment and/or give this recipe a rating! Above all, I love to hear from you guys and always do my best to respond to each and every comment. And of course, if you do make this recipe, don’t forget to also tag me on Instagram! Looking through the photos of recipes you all have made is my favorite! 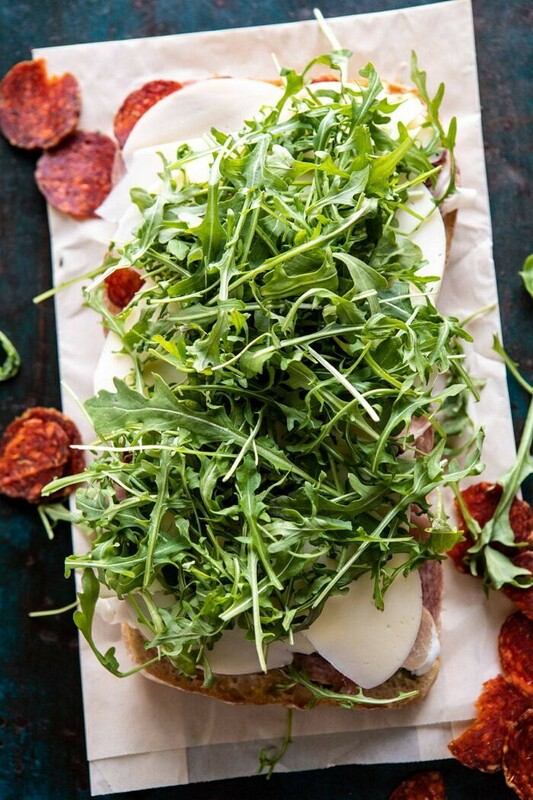 Crusty ciabatta bread, sandwiched with homemade Italian vinaigrette, spicy salami, salty prosciutto, fresh baby arugula, roasted peppers, provolone AND mozzarella. It's the easiest way to serve up a melty sandwich to a hungry group of guests. Perfect for your game day eats! 2. To make the vinaigrette. In a jar or small bowl, whisk together the olive oil, red wine vinegar, lemon zest, lemon juice, garlic, and oregano, until combined. Add the olives, jalapeños, and a pinch of pepper. 3. Lay the bottom piece of ciabatta bread cut side facing up on a baking sheet. 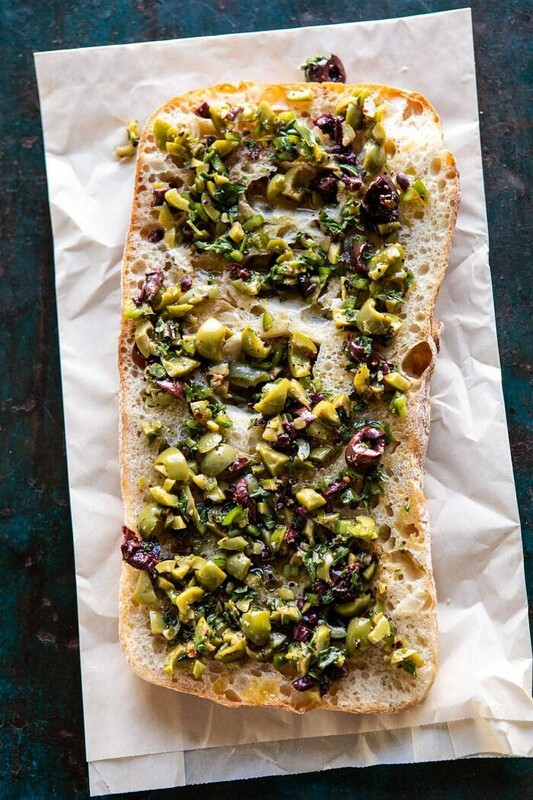 Spread the vinaigrette over the bread. Layer the basil, salami, prosciutto, and pepperoni on top. Add the provolone and mozzarella. Transfer to the oven and bake 10 minutes, until the cheese begins to melt. Remove from the oven and add the arugula, bell peppers, and top half of the ciabatta bread. Gently cover the sandwich with foil and return to the oven and bake another 10 minutes more, or until the cheese has melted. Remove the foil and cook an additional 5-10 minutes, until the bread is toasted. 4. Remove from the oven and let sit 3-4 minutes. Slice into 4 larger or 8 smaller sandwiches. Serve and enjoy! *To make ahead of time, assemble the sandwich all the way through step 3. Add the arugula, peppers, and top half of the bread. Wrap in foil and keep in the fridge for up to 1 day. To make, remove from the fridge while the oven preheats. Bake, in the foil for 20 minutes, remove the foil and bake an additional 10 minutes. One Bowl Chocolate Sheet Cake with Milk Chocolate Fudge Frosting. 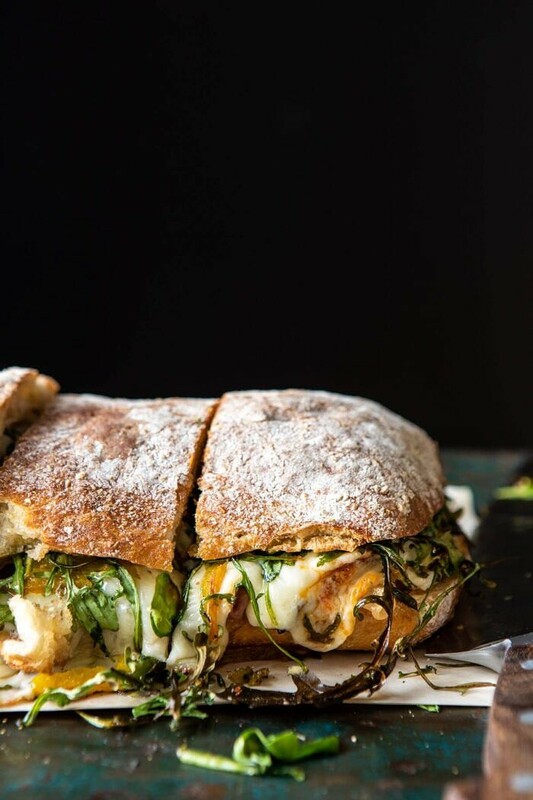 Antipasto Mozzarella Sandwich with Lemony Basil Pesto. 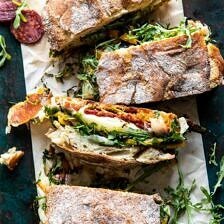 Marinated Veggie Cheese Sandwich with Sun-Dried Tomato Pesto. 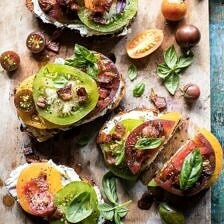 Opened Faced Tomato and Goat Cheese Sandwich with Hot Bacon Vinaigrette. Marinated Tomato and Grilled Veggie Cheese Board. I love to get big pieces of bread and then make all sort of melts and toasted sandwiches. Actually, to me, this is a way to “clean” the fridge with whatever lefovers we have after all meals we had during the week. Usually I like to toss some good roasted veggies, “embutido” or leftover meat and finally whatever type of cheese I have in hand (most of the times is manchego, since I live in Spain, hehe and mozzarella too) and then I love to add arugula in the end, just as you suggest. Vinaigrette are great for sandwhiches. I love any kind of melted sandwich idea! Thanks a lot for sharing! I am so glad you like this Susanna! I hope you love it when you try it!! I’m afraid there will be no party. Haha that works too!! I hope you love this Aline! 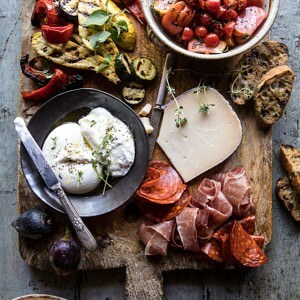 This sounds amazing and our family is definitely a meat, cheese and bread family! All of your recipes’ are wonderful and so easily adjusted to who in the family loves certain flavors and spices. So did your brother Creighton go to Creighton? I am living here in Omaha and just curious. Hi Denise! I am not sure I think he has been there before! I hope you try this melt! 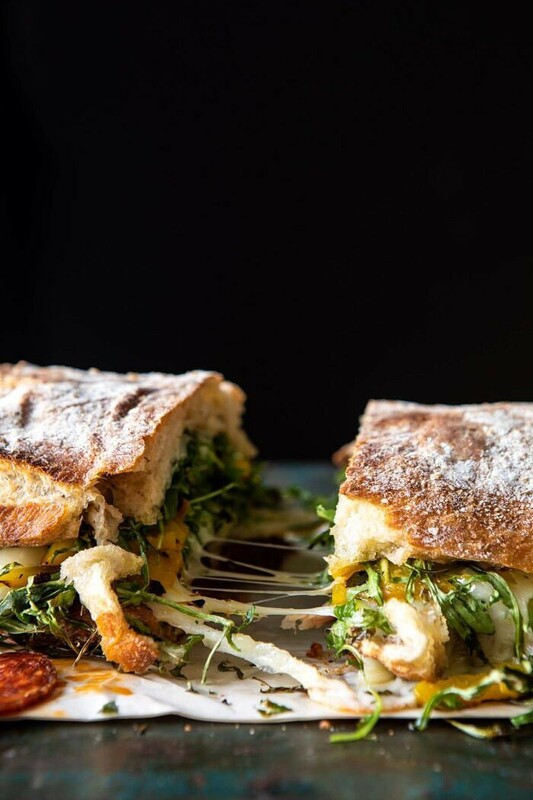 This looks amazing, and your cheese pull game is strong on this one! Thank you so much Kori! Gorgeous pictures as always. This looks delicious! Thank you so much Evelyn! DANG! This looks and sounds amazing. What a perfect idea for Super Bowl Sunday or, as a matter fact, any get-together with friends or family. 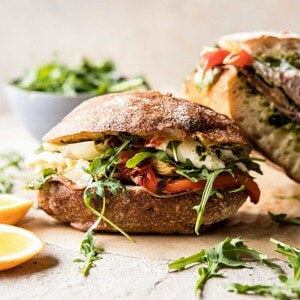 This Italian Sandwich has so many great components – the veggies, the variety of meats, the melty cheese and of course the crusty bread. My mouth is watering as I write. Thanks for the post. Thank you so much! I hope you try this! What would you suggest to use as a vinaigrette if we don’t like olives? Would it work just to leave them out? Some good alternatives might be sun dried tomatoes with a little bit of oil from the jar, or an artichoke tapenade, maybe? You could probably also use pesto…? This is such a fun idea and absolutely perfect for game day! I love this idea, so perfect for game day! Made this last night and it was so delicious I pretty much lost track of anything going around me. seriously. Since 1 someone doesn’t like olives, I just left them off his portion. He did, however, notice the lemon in the vinaigrette so I might leave that out next time and see what it’s like; personally, I’d love that vinaigrette on a salad!! It was a true hit, like ALL of your recipes around here, so goes in the keeper pile! Many thanks. I am so glad you liked this Betty! And I hope your someone loves this without the lemon in the vinaigrette! Thank you so much! I made this for my parents and my husband yesterday and it was a hit all around! It’s so warm and toasty and smells amazing while it cooks. I made the recipe exactly as you recommend – didn’t leave anything out. I was nervous about that because my dad doesn’t like anything too spicy and I’m not crazy about olives… But the flavors were so well-balanced, you could not detect too strong of any flavor – whether it was lemon, the pickled jalapenos, or the olives. It was just delicious. I used very fresh ciabatta and it was just bordering on too crusty – especially the bottom, as it cooked in the oven for a good while. So that’s something to consider when shopping for the ingredients. 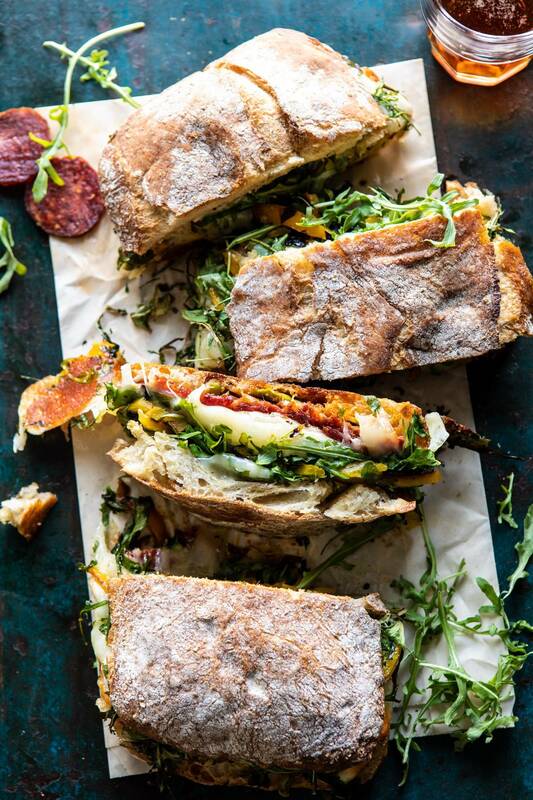 But overall – a delicious and impressive looking beast of a sandwich fit for a party! I ‘ll post photos on instagram and use the hashtag. Thanks for this yummy recipe! Hi Lauren! I am so glad you loved this recipe and it turned out so well for you! Thank you for making it! We made this last night & it was a success! It was very easy to assemble & incredibly flavorful. We also made a turkey, ham, & maple syrup ciabatta melt, which was also delicious. I like this because you can mix it up with different meats & vegetables you have in the fridge. We made it in advance & it turned out perfectly. Thanks for the recipe! Thank you so much Amy! I am so glad you loved this recipe! nice recipeees. Can with to try! Thank you!! I hope you love this melt! This looks INCREDIBLE and so rustic, I love it. Will definitely try this out or something similar. Thank you so much Julia! I hope you love this! Loved this! Thnks for the inspiration! This is a fantastic recipe! I used individual ciabatta rolls, because I have a picky eater who doesn’t like arugula. The flavors all meld together perfectly! The lemon, basil, and peppers, complement the salty meats nicely. Couple tips- if you worry about the heat from the jalapeños, Mozzetta brand makes a ‘tamed’ pickled jalapeño that isn’t hot. I also used jarred roasted red peppers because I’m lazy, and they worked great in this recipe. So, so , so good!